From the top floors of City Hall, as of January 2015, the view of downtown is about half -consumed by parking. See highlighted areas. Kansas City’s downtown is like an adolescent going through an awkward phase. It’s part of growing up, and we’re excited about where things are headed, but the process is at turns uncomfortable and confusing. File the parking situation under “uncomfortable.” That was the basis for Thursday’s conversation on Central Standard. As a city, we’ve gotten awfully used to being able to drive right up to any destination and park a safe, lazy distance from the entrance. One sign of a thriving downtown is the occasional inability to do just that. It’s only human to gripe when a lunch date is waiting and there’s not a parking spot to be found, but adding parking to neighborhoods already dedicating 50 percent of available land to parking may not be a good decision for the city’s future. 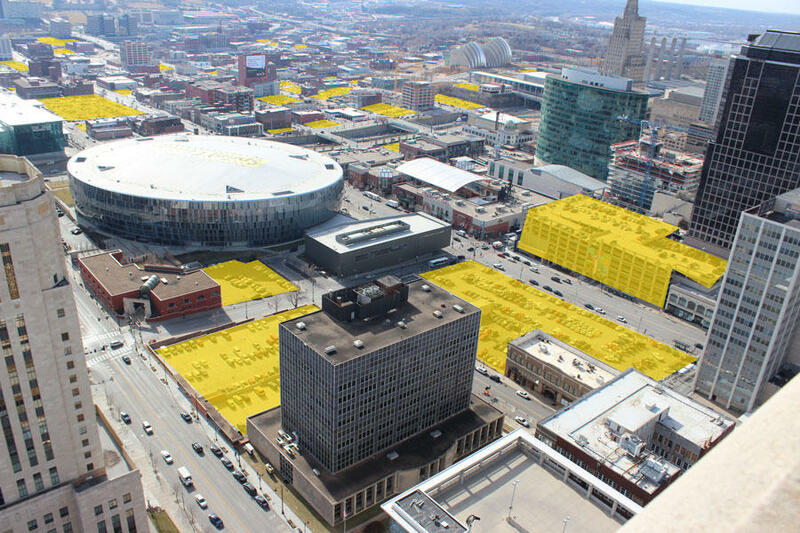 “Every parking space you have, particularly in downtown … is a piece of ground that is not a restaurant, that is not a new downtown loft, that is not a business,” says Thomas Morefield of the architecture firm BNIM. He blogs about parking at urbanangle.net. But in the meantime, what do you say to downtown business owners whose customers are accustomed to a certain level of convenience when it comes to parking? Especially in an atmosphere where access can be diminished due to streetcar construction? Sean O’Byrne of the Downtown Council represents the very business owners who are feeling the strain. Still, he maintains that density downtown will benefit businesses more than parking. Remember, all the space dedicated to parking is space that’s not being used for a loft, a music venue or a pizza shop. “Downtown Kansas City’s been an underutilized market for years,” O’Byrne says. Kansas City currently has 20,000 downtown residents. O’Byrne says 40,000 would constitute a healthy population in the district. “We are just back in the game as far as development is concerned,” he says. So what did the guests on Central Standard recommend with respect to parking? Before adding more parking, it would be worth investigating whether we’re properly managing the spaces that exist. There are lots of different kinds of parking. For example, metered parking in busy areas helps “move inventory” – currently the most desirable parking spots in the Crossroads and City Market come free and without time limits. The parking crunch is felt most acutely when big events like First Fridays take place. Are we vying for parking spots all the time, or just a handful of days a year? Maybe there is a way of managing parking for events, rather than making 365-day-a-year design changes to our city. The abundance of surface lots is part of a normal lifecycle for an American city, says Sean O’Byrne. Every surface parking lot represents a place where something was abandoned and razed during a period of suburban flight, but also a site where something can be built in the future. 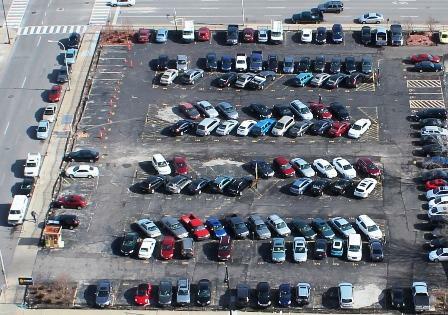 It might be painful, but the tension between parking and development is a good thing. It’s a symptom of growth. It means space downtown is in demand. No matter what happens with parking, our expectations will probably have to be part of the change. We've had it so good for so long. But luckily, parking isn't the only downtown attraction these days. Downtown Kansas City is practically half parking lots--so why is it so hard to find a spot on a First Friday in the Crossroads? The availability and cost of parking could be key ingredients to developing a vibrant downtown.